The Sternoclavicular Joint is a saddle kind of the synovial joint. The circular sternal end of clavicle and the hollow socket articulates with each other at the nearby part of the 1st costal cartilage and at the superolateral angle of the manubrium sterni. The medial end of clavicle improperly fits into manubrium’s shallow socket, as it rises higher than the manubrium. 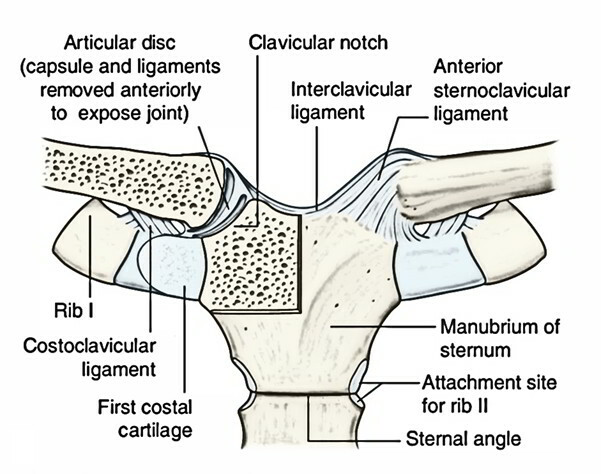 The medial end of the clavicle is displaced by a strong connection of thick articular disc of fibrocartilage superiorly to the clavicle and inferiorly to the 1st costal cartilage. The articular surface of clavicle is convex from above downwards and somewhat concave from front to back. The articular surface of sternum is reciprocally curved. The articular surfaces are covered with fibrocartilage. The joint capsule is connected to the margins of the articular surfaces consisting of the periphery of the articular disc. The synovial membrane lines the internal surface of the fibrous joint capsule, reaching the edges of the articular disc. Anterior and posterior sternoclavicular ligaments:They reinforce the joint capsule anteriorly and posteriorly. The posterior ligament is weaker than the anterior ligament. Interclavicular ligament: It is T-shaped and links the sternal ends of two clavicles and strengthens the joint capsule superiorly. In between, it is connected to the superior border of the suprasternal notch. Costoclavicular ligament: It anchors the inferior surface of the sternal end of clavicle to the first rib and adjacent part of its cartilage. The sternoclavicular joint allows the movements of pectoral girdle. This joint is critical to the movement of the clavicle. Dislocation of the sternoclavicular joint: It is rare because the sternoclavicular (SC) joint is highly strong. However, dislocation of this joint in people below 25 years of age may result from fractures through the epiphyseal plate because epiphysis at the sternal end of clavicle does not unite until 23-25 years of age. The medial end is normally dislocated anteriorly. Backward dislocation is avoided by the costoclavicular ligament. Transmission of weight of the upper limb: The weight of the upper limb is transferred from scapula to the clavicle through coracoclavicular ligament, and then from clavicle to sternum through sternoclavicular joint. Some of the weight is transmitted to the first rib through costoclavicular ligament . When a person falls on the outstretched hand the force of draft is usually transmitted along the length of the clavicle, i.e., along its long axis. The clavicle may fracture at the joint of its middle and lateral third but it is unusual for the SC joint to dislocate.